Alanda April 4, 2015 27 Comments This post may contain affiliate links. ,In this video we show you how easy it is to convert svg files to the fcm files. The fcm files are the type of file that is required by your Brother Scan n Cut. Brother uses it’s own format for ScannCut files, if you want to use SVG files you need to convert them first. To do this you need to use the Brother Scan n Cut Canvas software. It’s a free online tool and converting files is quick and easy. One thing you need to be aware of is that you cannot see fcm files on your computer or your mobile device. You will only see fcm files when you have loaded them into your machine, or when you are using the online canvas workspace. Thank so very much. I have only had my machine for a couple of months, but you have made it so very exciting for me to get really cracking. Thanks. Thank you for your lovely comment Cherry. So glad we have been able to help. 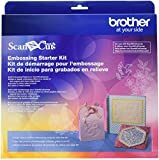 We love our Brother Scan n Cut. I would like to know how to make a plastic stencil so I can pounce the free motion stencil onto my quilt. What would be the setting to use. Thank you so much for tutorial I was struggling but not now wonderful for sharing. Happy we could help Carol. Hi, do you have any idea why the svg file I’m trying to import is not recognized? Canvas keep showing the following message: “this file type can’t be used”. It’s a svg file.. This happens now and then, usually there is something wrong with how the file has beens saved, the format is not quite right. If you would like us to have a look at the file you can email it through to us and we will have a play with it to see if we can sort out the problem. To convert SVG files to the .fcm files, you can try the Easy cut studio from http://www.easycutstudio.com , and it work fine. Yes, we already have the EasyCut software and do love it. However, my only disappointment is the support. I emailed a couple of times sometime back and never received a response. Would love to promote your product more but without the support, I’m a little hesitant to do so. Hi, is it possible to use a Corel file in scan n cut? Or do I have to convert it to .fcm? Any files to be used in the ScanNCut machine need to be .fcm or an svg (if you the have latest version of the machine). You can import the following files into ScanNCut Canvas online software – jpg, png,bmp,svg, gif and dxf and this will allow you to convert them into an .fcm file that you can use in your machine. Wow. You guys are an amazing source of information. I’ve had my Scan n cut for a few days and have a lot to learn. Thank you! Thank you Kathy. You might also like to see our YouTube playlist on the Brother ScannCut https://www.youtube.com/playlist?list=PLp1N6F-V-Q21qOFi-4p2bbjmBkJk_zJkI and we also have Brother ScanNCutTraining Courses available at the Alanda Craft Training Academy -http://premium.alandacraft.com. I am sure you are going to love your ScanNcut as much as we love ours. I am new to this and I am tring to turn a jpg file into the fcm file for the scan and cut. I can get canvas to do what i want it to but then when I download it tries to download as a PDF. and it won’t let me go any further. thanks in advance for your suggestions.. This is most likely a setting on your computer Sharon. You may have it set as a default to save download files as a PDF. This isn’t something that Canvas does. I have a scan and cut and for the most part love it. I have been unable to use any font other than what is in canvas or on the machine. These are very limited. I do a lot of names with a design and it just doesn’t convert if there is a font involved. I have tried Corel draw,Easy Cuts, Make the Cut and none will work. I have saved then as svg and tried the conversion on Canvas and the batch converter on Easy Cuts but fonts just won’t work. I watched a video of doing a word then making a contour behind it to import it then breaking it apart. Boy that’s a lot of steps. lol I have printed it on paper then scan it in to do direct cut but again several step process. Thank you for any help or answers to this. I have tried inkscape also. I just now tried to import a file as a png and also a jpeg. I get a notice that this type file can not be used. The online ScanNCut program can be used for all models of the ScanNCut. EasyCutStudio can also work for all models of the ScanNCut. Hope that is what you were asking. That’s great to hear Maxine. You are going to love your ScanNCut, it is just so much fun creating. Don’t forget to check out our Training Academy for full comprehensive training http://premium.alandacraft.com and the store for cutting file http://store.alandacraft.com. And I do hope you have downloaded the free cutting files that are available.